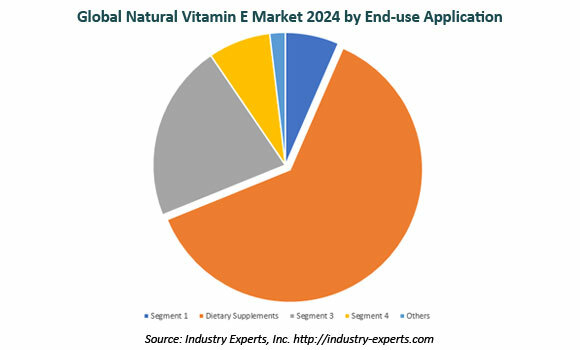 Food & Beverages and Cosmetics Sectors to Drive Global Demand for Natural Source Vitamin E to Reach 17K Metric Tons by 2024 – Market Report (2018-2024) by Industry Experts, Inc.
Industry Experts, Inc. unveiled a new 2019 version of its global market report on Natural Vitamin E. The new version of the report entitled “Natural Source Vitamin E (Tocopherols and Tocotrienols) – A Global Market Overview” reveals that Asia-Pacific emerged the largest market for Natural Vitamin E and also projected the fastest growing market through to 2024 with a CAGR of 6.1%. Natural vitamin E demand will stem from increasing usage in food & beverages and cosmetics & personal care sectors. Emerging economies have been witnessing a paradigm shift in terms of shortage of time and eating patterns, triggering a growing demand for vitamins that can enrich food and drink. Natural vitamin E enriched foods are full of supplemental nutrients that can offset any nutrients that an individual’s daily diet lacks. The natural vitamin E industry is also likely to be bolstered by increasing usage of products that enable in preventing aging of skin and promise several other benefits to the skin, such as UV protection and moisture content to maintain a healthy and youthful appearance. Natural Source Vitamin E products analyzed in this study include Tocopherols and Tocotrienols. The end use application markets covered in the report comprise Animal Feed, Dietary Supplements, Food & Beverages, Cosmetics & Personal Care and Others (pharmaceuticals, medical and infant nutrition). The report reviews, analyses and projects the natural source vitamin E market for global and the regional markets including North America, Europe, Asia-Pacific, South America and Rest of World. These regional markets further analyzed for 14 independent countries across North America – The United States, Canada and Mexico; Europe – Germany, France, Italy, Spain, The United Kingdom and The Netherlands; Asia-Pacific – China, India and Japan; and South America – Brazil and Argentina. This 404 page global Natural Vitamin E market report includes 277 charts (includes a data table and graphical representation for each chart), supported with meaningful and easy to understand graphical presentation, of market numbers. The statistical tables represent the data for the global market value in metric tons and value in US$ by geographic region, the product segment and application area. This study profiles 21 key global players and 47 major players across North America – 7; Europe – 7; Asia-Pacific – 32 and South America – 1. The report also provides the listing of the companies engaged in the manufacturing and supply of natural vitamin E as well as major players in the vitamin E end-use industries such as human nutrition, animal nutrition and personal care. The global list of companies covers addresses, contact numbers and the website addresses of 193 companies. Industry Experts, Inc. unveiled a new 2018 version of its global market report on Natural Vitamin E. The new version of the report entitled “Natural Source Vitamin E (Tocopherols and Tocotrienols) – A Global Market Overview” reveals that Asia-Pacific emerged the largest market for Natural Vitamin E and also projected the fastest growing market through to 2024 with a CAGR of 6.7%. The market for nutraceutical products is poised to witness an impressive growth over the coming period primarily owing to consumer awareness regarding improved health and the increase in aging population across the globe. Dietary supplements enriched with natural vitamin E are finding wider acceptance among consumers for improving energy and endurance and reducing muscle damage after exercising. Also, a few alpha tocopherol-containing health supplements have been found to decrease the risk of bone fracture for the geriatric population, in addition to improving overall muscular strength. This is another factor that is likely to impact natural vitamin E market growth in a positive manner. Dietary Supplements constitutes the largest application for natural vitamin E globally, volume consumption of which is slated to compound annually at 4.2% over 2017-2024 in reaching a projected 10.9 thousand metric tons by 2024 from an estimated 8.2 thousand metric tons in 2017. This 400 page global Natural Vitamin E market report includes 277 charts (includes a data table and graphical representation for each chart), supported with meaningful and easy to understand graphical presentation, of market numbers. The statistical tables represent the data for the global market value in metric tons and value in US$ by geographic region, the product segment and application area. This study profiles 21 key global players and 47 major players across North America – 7; Europe – 7; Asia-Pacific – 32 and South America – 1. The report also provides the listing of the companies engaged in the manufacturing and supply of natural vitamin E as well as major players in the vitamin E end-use industries such as human nutrition, animal nutrition and personal care. The global list of companies covers addresses, contact numbers and the website addresses of 193 companies. Industry Experts, a multi industry focused market research firm, has today announced the release of an exclusive a research report on Indian Natural Vitamin E market. The new report ‘Natural Source Vitamin E (Tocopherols and Tocotrienols) – An Indian Market Overview’ reveals that the market for Natural Vitamin E is forecasted to reach US$2.2 million in 2014. Indian Natural Vitamin E market is in infant stage and is growing at a healthy rate. Currently, natural vitamin E is being mainly used in dietary supplements followed by fortification of foods & beverages and cosmetics. Preference towards the application of Natural Vitamin E in animal feed is expected to pick up in next couple of years which is almost negligible or very low at present. Industry participants also expect that natural vitamin E is preferred to use, especially in high end pet food segment. Inline to the expansion of Indian nutraceutical market, the demand for vitamins has been increased over the years. Global leading nutraceutical companies such as Amway and Herbalife are investing in manufacturing nutraceuticals in India either directly or through contract manufacturers. The Indian natural vitamin E market is composed of dietary supplements, fortified foods & beverages and cosmetics. Dietary supplements segment leads the market followed by food & beverages. In India, Baddi (Himachal Pradesh) and Banglore (Karnataka) are the regions with highest number of nutraceutical manufacturers. These companies have been preferred partners for international as well as domestic pharma and nutraceutical manufacturers. Natural source Vitamin E products analyzed in this study include Tocopherols and Tocotrienols. The end use application markets covered in the report include Animal Feed, Nutritional/Dietary Supplements, Food & Beverages and Cosmetics. The report reviews, analyses and projects the natural source vitamin E market for India. Indian Natural Vitamin E volume market, estimated at 24.5 metric tons with a value of US$1.9 million in 2013 and forecast to be 27.1 metric tons valued at US$2.2 million in 2014, is further projected to reach 55.1 metric tons worth US$5.4 million by 2020, thereby maintaining a volume CAGR of 11.7% and a value CAGR of 15.8% between 2012 and 2020. The study includes 38 charts (includes a data table and graphical representation for each chart), supported with meaningful and easy to understand graphical presentation, of market numbers. The statistical tables represent the data for the global market value in metric tons and value in US$ by geographic region, the product segment and application area. The report also provides the listing of the companies engaged in the manufacturing and supply of natural vitamin E as well as major players in the vitamin E end-use industries such as human nutrition, animal nutrition and personal care. The list of companies covers addresses, contact numbers and the website addresses of 78 Indian companies and 94 international companies.